This school year I took on the challenge of teaching our Economics and Entrepreneurship class. While I took Econ in high school, it seems I have retained very little of that information. So as I teach the concepts of supply and demand, labor markets, and utility, I am doing my best to try to throw in some fun simulations and games from time to time. 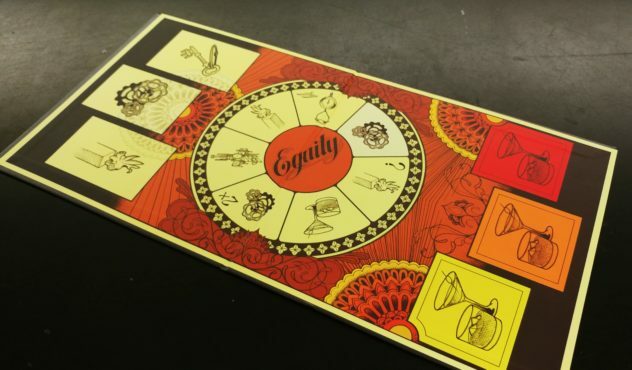 You can imagine my joy when I saw a post about Equity, a game out of Norway from the mind of Markus Moestue. The game promised economic adventures as players seek to make their fortunes and be the first person to own a yacht plus $50,000. Here’s hoping I can transfer these skills to the real world! Equity has a unique gameplay progression I haven’t really seen in another game. Each round begins the same, with the active player rolling a die. The results of this roll, combined with the stock the player owns, leads to a payout for that round. After all the money-making, the turn can take one of many different directions. Some rounds will have you auctioning off a new piece of stock (or two), or maybe a piece of art. 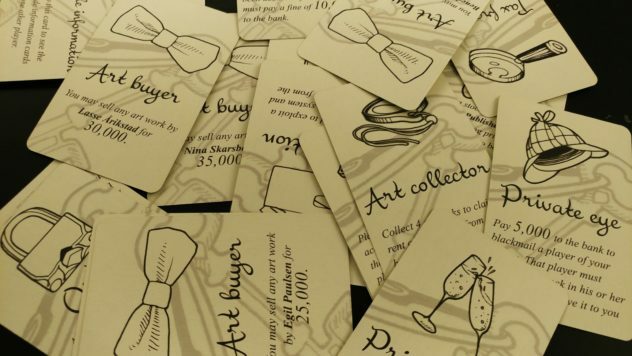 The art might also be sold in a blind auction, where players all write their bids down on a piece of paper and then reveal simultaneously, with the highest bid winning. My favorite space involves three small decks of five cards, each featuring an amount of money. Four of the cards are passed around to players, while the fifth is then put up for auction. Players utilize what little knowledge they have to bid on the card, hoping it has a high value and doesn’t lead to them losing money. The actions are all laid out on the game board, and you progress through them in the same order every game. The final action is always the market, which forces players to put something up for sale, whether a piece of art or stock. At this time, players also have the opportunity to purchase a yacht, which is obviously needed to prove that you’re wealthy. Play continues until one player has a yacht and $50,000, at which point the game ends and the player with the yacht and the most money wins! I really like how this game feels like a collection of mini-games. There’s a good variety in what happens on your turn, and the events occur at such different intervals that you’re never bored. It’s also a bit fun to have your money determined by a dice roll, as your performance in the game can be drastically changed in an instant. We had a lot of laughs in the game as players overbid during the lottery, or continually rolled low numbers which led to low payouts. 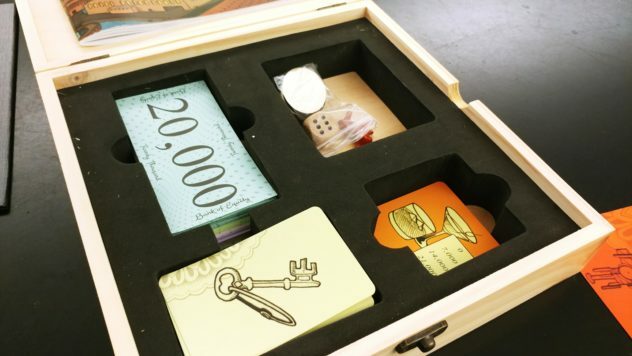 Equity has many interesting ideas, and you’ll have some fun with the “wheeling and dealing” and “press your luck” aspects of the game. But as a whole experience, it feels a bit shallow. In the games I have played, the winner was determined by a lucky draw or a good roll. The game also ends way sooner than I would have expected. One time it ended as soon as we had the capability to buy a yacht! Equity needs a little more balance to make it a game I would bring to the table more often. I also struggle to see the economic connections of the game. 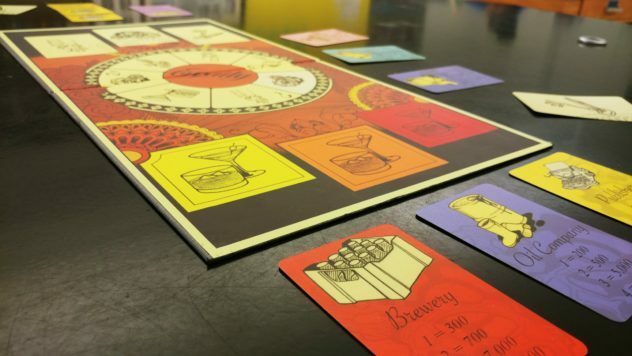 It doesn’t seem to replicate many of the concepts we have covered in class, to the point that I haven’t really been able to use the game as a teaching tool. I feel that a little more playtesting may have led to a more solid overall experience. I wonder what would happen if the game board was adjustable so that you do the actions in a different order, or maybe even have the action be determined by cards or a dice roll. I also question the high dollar amounts on the more gambling aspects. In our games, players were always playing it safe by bidding right down the middle. Often this was because it was the most mathematically and economically reasonable thing to do, and in a game that’s about the economy, it seems silly to suggest that players be more risk-taking. That being said, I still enjoy playing the game. It is packed with those moments that cause you to have emotional reactions out loud…someone wins a close auction; somebody has a great roll that puts them in a dominant position; someone loses a ton of money on the lottery cards…these situations are great and lead to a lot of laughs! This game reminds me a bit of Monopoly, and if you and your gaming group enjoy that game but want something shorter, I think you’ll have a good time with this game. Others who prefer a little less luck in their games may need to look elsewhere, but those who like a quick game that makes them feel like a millionaire will find a lot of fun in Equity. 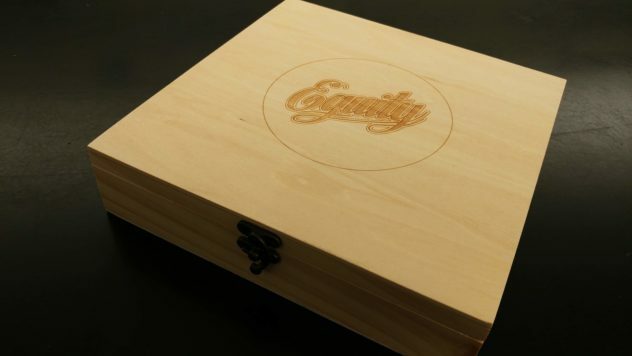 You can purchase Equity through the game’s website. The creators of Equity provided us with a retail copy of the game. This in no way influenced our opinion of this game.